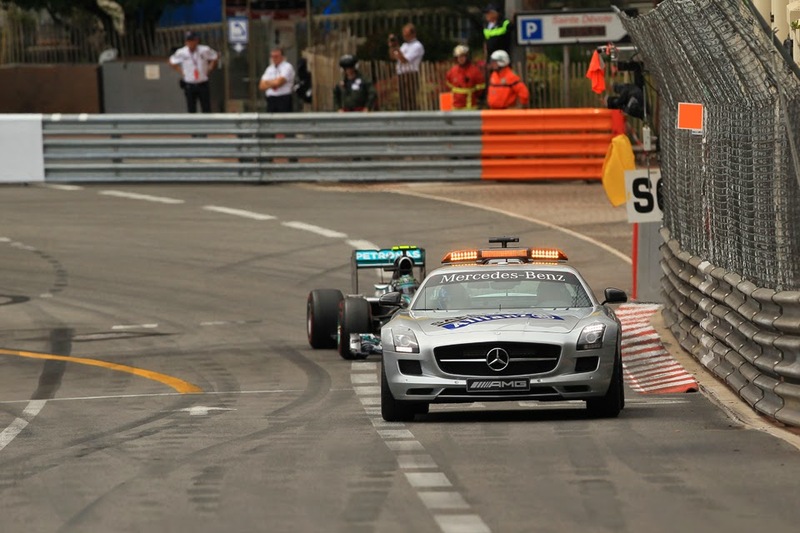 Talking about F1: The F1 blog: Should Lewis have taken the Monaco pit call into his own hands? Should Lewis have taken the Monaco pit call into his own hands? One more thing on Nico vs. Lewis in Monaco. Then I promise to be quiet about it. First off, let's go back a year-and-a-bit, to Melbourne for the opening race of the 2013 F1 season. Twenty laps in and things at the front were at an impasse seemingly. The nominal front-runners had made their first pit stops, but Sebastian Vettel, struggling with his tyres, had two Ferraris right on his tail, with Felipe Massa ahead having qualified marginally the quicker than Fernando Alonso in a wet-to-dry session. All however were stuck behind the unlikely leader of Adrian Sutil in the Force India, who'd started on the prime tyre and hadn't yet pitted. But meanwhile, Kimi Raikkonen in a Lotus known for excellent tyre life lurked menacingly behind the lot of them. Fernando wanted to do something about it. His team was minded to wait until a more proportional stint length was completed, and with Massa as the lead driver on track ordinarily getting first shout on when to pit, Nando took matters into his own hands and issued a fait accompli. With the minimum number of seconds' warning that his team would require to get ready to service him, and by which time he'd already be motoring down the pit lane, he announced he was pitting. In so doing it changed everything. Vettel, Sutil and eventually Massa pitted in response, and when they emerged Alonso had cleared them all. As it was, Kimi's tyre life was such that he was able to win nevertheless, but Alonso could claim a fine second place way ahead of the rest. It was a risk for Nando, but it did the trick for him. And back to Monaco last weekend, where we came in. There was something of a footnote underneath all of the frenzied prose of the whole Nico vs. Lewis stuff, that Lewis Hamilton - having not cleared Nico Rosberg at the race start - realised given the track they were at his only realistic hope of clearing his team mate for the win was to do something clever with pit stop strategy. However only one stop was planned, and it just so happened that Sutil (him again) had a big smash at the chicane at the rough point of the race that the stops were likely. But it gave Lewis an idea, having seen the wrecked Sauber at rest and surmised as many did that a safety car appearance was imminent (whatever Toto Wolff's talk of crystal balls) he could dive into the pits immediately even though the safety car hadn't been confirmed yet. The point of the wheeze being that with the probable subsequent safety car deployment Nico then would have to cruise around at the delta times for a lap before pitting himself and Lewis would thus be able to clear him. And then win, presumably. Lewis's plan had a lot of plausibility. He had roughly thirty seconds after seeing the crash before he reached the pit entrance. And had he indeed pitted then as things transpired, with the safety car indeed appearing as predicted, Lewis almost certainly would have acquired the lead and then won, as described. The actual confirmation of the safety car was curiously tardy nevertheless, so Lewis pitting would have even with the time lapse been as mentioned in anticipation of one. And to pit would still have been a decision out of the box - as after all several cars a way behind Lewis such as Raikkonen, Ricciardo, Alonso and others didn't pit either (the first to pit was Jenson Button in P9). It also would have involved defying his team, as having radioed in with the idea Lewis was told to stay out, Mercedes taking the broader view - i.e. protecting the team's 1-2 with a safety first (figuratively and literally) approach. So, should Lewis this time have done what Alonso did in Melbourne and taken the matter into his own hands? From the point of view of what it would have done for his race the analysis says that the answer is 'yes'. And while it's easy to say from where we're sitting a look at the lap charts and time gaps at that point shows as well as that it probably would have got him the lead, also that even after constructing worst case scenarios Lewis had very little to lose from taking a punt on pitting. By doing this, in defiance of the team or not, the team would have been obliged to turn him around as normal and we've seen repeatedly that crews only need a few seconds' notice in order to change tyres swiftly. And even had there been no safety car there was a nice gap between Alonso and Kevin Magnussen that he would have dropped into after pitting. And with a 25 second pit stop loss time he'd have nine seconds of clear air before he reached Alonso ahead, and a good chance to push on his fresh tyres - assuming he could warm them up quickly enough - and take the lead from Rosberg via an undercut. Might it have been Lewis celebrating the Monaco win? Even still with the late call increasing the probability of pit stop fumbles, it would have taken three seconds plus of fumbling (unlikely) for Magnussen to get ahead. But even if he had been dropped in behind Magnussen the McLaren was pitting soon anyway, and prior to pitting Hamilton had 12 seconds in hand back to P3, so even in this absolute worst case scenario which requires two separate things to have not gone for him (i.e. no safety car then a seriously botched stop), he'd have very likely retained the P2 that he had anyway in the eventual shake out. 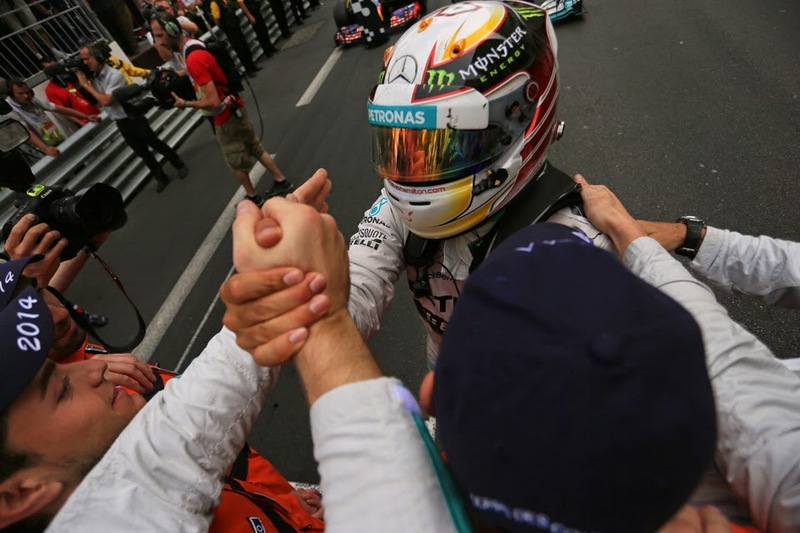 Lewis Hamilton on occasion these days talks of his admiration of Fernando Alonso. It was speculated too that in his Mercedes switch he was tempted to make a team very much his team, and it's hard to dispute that Alonso at Ferrari offers a template for that. Indeed perhaps in a similar vein Lewis did at one point reference the Michael Schumacher and Ferrari partnership as inspiration for his Merc move. Lewis however in Monaco didn't defy his team, whatever were the arguments he stayed toeing the line (Mark Hughes speculated that maybe after his ticking off for defying the team in Spain he didn't want to do the same again). You rather wonder whether in the same situation Alonso would have been quite as obedient. Thanks, Graham. This was NOT a case of Hamilton wanting to go against the teams lead-driver-in-first policy. He wanted to make an unscheduled stop, and a smart one. In light of your revelation that Rosberg made an unauthorized MGU mode change a race before Hamilton did it, Lewis looks better all the time. But he SOUNDS quite bad. I thought he'd become a gentleman on arriving at Mercedes; I hope he's not falling back into his old gangsta' rut. Its a different environment altogether though isnt it ? 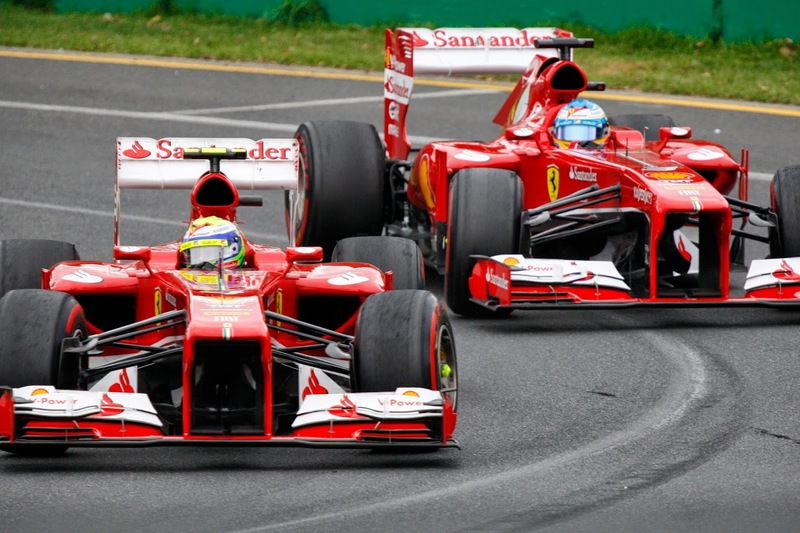 Ferrari - Alonso enjoys No.1 Status. Merc, Ostensibly - the drivers get equal treatment - so they have to abide by whatever pre-race agreements are in place otherwise its anarchy. If anything it was disingenuous of Lewis to say what he did on the Radio about "knowing they wouldnt bring him in" (Or was he just airing the obvious ?) - especially in light of the fact that he's been on the receiving end of the beneficial "Race leader gets priority" position in the last four races. The article shows that you're right to say Dominic that this wasn't about Merc having a lead driver first policy (or about Lewis trying to go against it). Instead Merc was just being safety first in protecting its 1-2 in its decision to keep Lewis out (as I also said). And what Lewis said about McLaren having a policy over being able to decide themselves to pit if they think the safety car's about to appear also sounds like it has truth in it. It also sounds like Merc doesn't have the same policy, which may explain Lewis's 'I knew you wouldn't bring me in' comment. As for the different environment point, I'm not sure. Had it been Alonso who'd been at Merc a year and a bit and been in that situation in Monaco would he have taken it upon himself to pit? Probably, I reckon. Let's not forget either that Alonso didn't have his status in the Ferrari team bestowed, he established it over time, and part of his establishing it was down to him showing himself capable of taking these sorts of decisions out of the team's hands.